I typically write my own articles. I do feel this is an important topic and the content below does it justice. My own thoughts are added as well. The surge in innovative start-ups in retail banking has intensified over the past several years. Until recently, the focus has been on those start-ups that were competing directly with banks for customers. Today, however, a broader category of fintech players has become more prevalent – start-ups that are being financed or are partnering with traditional banking organizations to improve the overall consumer experience. According to the 7th Annual Innovation in Retail Banking Report from Efma and Infosys Finacle, the highest perceived threat to banking is from tech companies like Google and Apple, seen as a high or very high threat by 45% of banks. The second highest threat is perceived to come from start-ups (41% of banks regard the threat as high or very high), even though even the largest of these firms still lack significant scale. 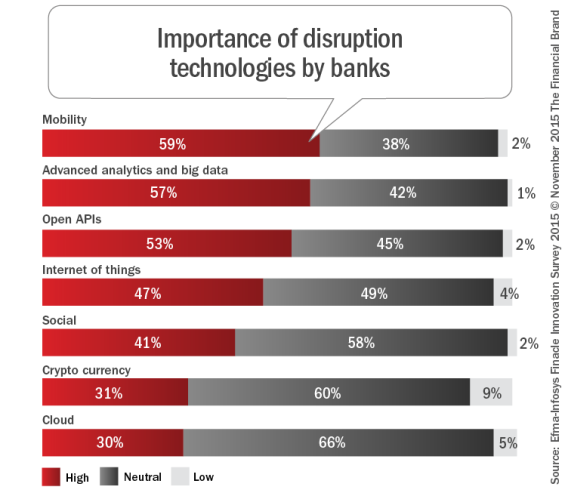 So, while the banking industry overall perceives an increasing threat of industry disruption in retail banking – 72% regard the threat as high or very high from at least one group of potential competitors – some firms are looking to these same new fintech start-ups as potential vehicles to enhance products and services, reduce costs and/or expand market share. The 60-page Efma study also found the banking industry responding to these new threats by increasing investment in innovation. The term ‘disruption’ has been debated repeatedly when discussing the impact of new fintech start-ups on the banking industry. While there has definitely been a great deal of activity in the areas of mobility, analytics, and the ‘internet of things’, the Efma report notes that the level of disruption has been limited somewhat due to regulatory constraints and consumer inertia. When asked which technologies were the most disruptive, Efma found that ‘mobility’ and ‘advanced analytics’ were perceived to be most disruptive, with 59% and 57% of the respondents believing the disruption level was either ‘high’ or ‘very high’. These were followed closely by ‘open APIs’ (53%) and the ‘internet of things’ (47%). Interestingly, ‘cryptocurrencies’ and the ‘cloud’ were seen as lower threats despite increased discussion around the impact of the blockchain. While each of these technologies are important in their own right, the ability to leverage advanced analytics may be the most important from a competitive perspective since legacy banking organizations have unequalled insights into customer demographics, behaviors and trends. In the research report, Efma provides several case studies of organizations that have used customer intelligence to their advantage. Beyond disruptive technologies, disruptive business models such as P2P represent an area of significant change. In addition to a payment strategy combined effectively with social media (Venmo), P2P has also had an impact on lending (Prosper and Lending Club), money transfer (TransferWise) and even investment services. As noted in the Efma research, the core business of most banks is providing a checking (current) account with associated payment, transaction, savings and investment/insurance services. While there are global examples of start-ups offering core services, the number of firms offering a wider breath of services is still relatively small. The UK, however, is quickly becoming an interesting market, since relaxed regulations have enabled a number of mobile-first banks to become active players – including Atom, Starling, Lintel, Open Bank and Mondo. Most other start-ups globally are using a ‘bank-lite’ model based on a prepaid debit card linked to a mobile phone app. 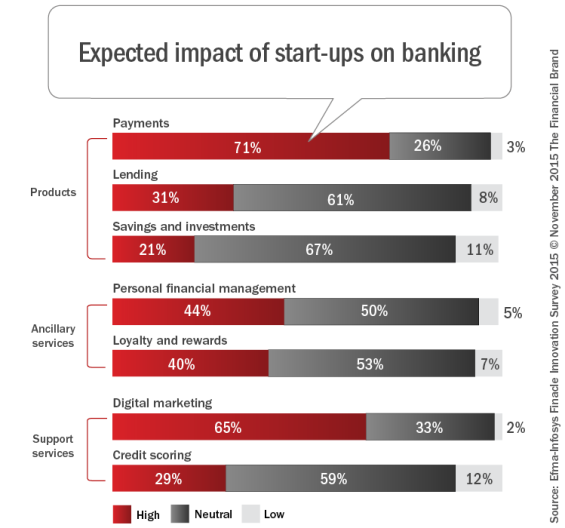 When asked about the impact of start-ups, Efma found that Payments and Digital Marketing were the areas where banks expected start-ups to have the greatest impact. Almost three-quarters of banks (71%) believed the impact will be high or very high in payments, with the greatest impact on mobile P2P payments (61%) and mobile wallets (54%). Close to two-thirds (65%) expected the impact to be high or very high in digital marketing. The study found that 43% of respondents were positive or very positive about working with start-ups as business partners and slightly less (41%) felt the same way about working with start-ups as suppliers. Less than 10% of banks were negative on either concept. 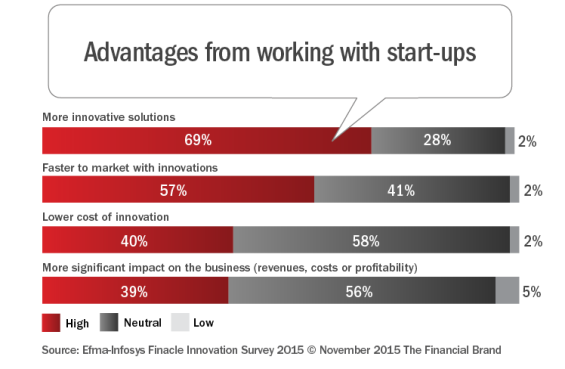 A primary reason for working with fintech start-ups was to improve the innovation process. This includes the ability to provide more innovative solutions (69%), impact speed to market (57%), lower the cost of innovation (40%) and make a ‘business impact’. Despite the perceived advantages of working with start-ups as part of the innovation process, the frequency of banks working with fintech firms is still very modest. The most common areas of cooperation are in the payments, digital marketing and lending areas. As more banks begin to work with start-ups as a normal course of business, the results should become more positive. 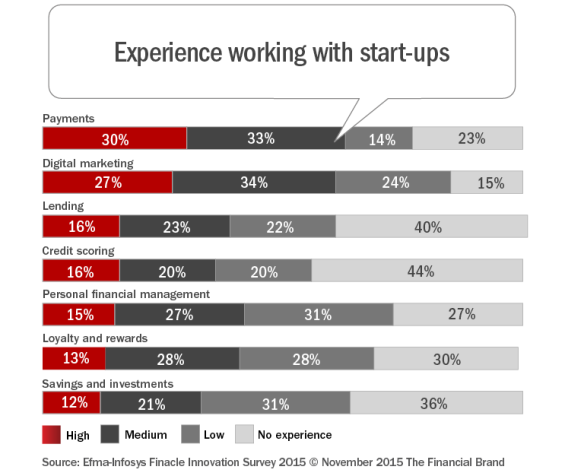 Even with the best of intentions, there are still challenges with working with fintech start-ups according to the Efma research. As could be expected, the biggest challenges mentioned were with regulations and security, where 53% and 50% of the banks respectively found challenges to be high. It should also not come as a surprise that ‘culture’ was also perceived to be a challenge. The two primary approach to working with start-ups seen over the last couple of years is through accelerators/incubators, and through investing in start-ups. 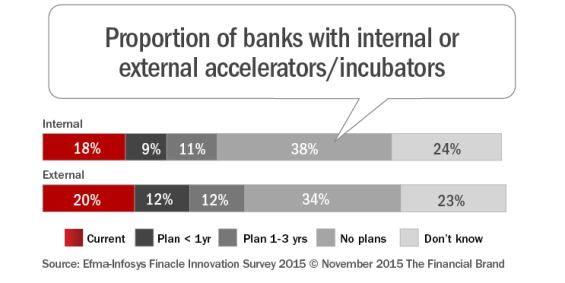 Our survey found that approximately one fifth of banks now have their own internal incubator or are partnering with an external accelerator/incubator. When interviewed by Efma, Debbie Bracken, Managing Director and Global Head, Innovation Network at Citi Ventures, described the purpose of an incubator/accelerator strategy. “Citi Ventures actively seeks partnerships that marry entrepreneurial speed with corporate scale to successfully accelerate new solutions. Working with Plug and Play enables us to deepen our relationships with companies, investors and entrepreneurs that are passionate about the future of financial services”. An alternative to an incubator/accelerator strategy is to actually invest directly in a fintech start-up. Efma estimated that only 10% of banks have dedicated corporate venture funds to invest in start-ups (including Santander (Spain), National Bank of Australia (Australia) and Citigroup (US). Ad-hoc investment in start-ups was found to be more common but still only pursued by around 20% of banks. Some banks have gone one step further, buying control of an innovation start-up or design firm outright. The most documented examples include the acquisition of Simple and Spring Studio by BBVA and the acquisition of design and product development firms by Capital One. Another example I’m proud to share is WSFS Bank’s investment in Zen Banx, an innovative currency moving company with fascinating biometrics authentication tools coupled with its top-notch foreign exchange capabilities. The collaboration between the two companies added value to both, and injected deeper interest and understanding of innovation in an already innovative bank. 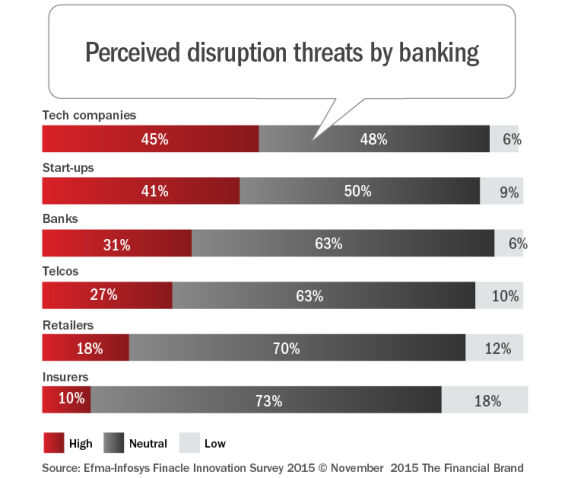 Efma notes that the combination of disruptive technologies and disruptive business models, together with increasing venture capital investment in fintech start-ups, is raising the perceived level of threat to established retail banks. While the impact to the banking industry is somewhat limited to date, many in the industry believe that we are at a transformational tipping point. Despite these challenges, there is also the belief that we are at one of the greatest junctures of opportunity in the banking industry, with the potential to acquire new tools and capabilities through partnership or purchase. The Efma study provides dozens of case studies in their report of legacy and relatively new banking organizations that have benefited from these new innovation opportunities. § Work with start-ups either as partners or suppliers, since start-ups are responsible for most of the radical innovation in financial services. § Focus on understanding and reacting to developments in the most disruptive technologies (e.g. mobility, advanced analytics and open APIs) and where start-ups are likely to have the most impact (e.g. payments, personal financial management and digital marketing). The 60-page 7th Annual Innovation in Retail Banking Report from Efma and Infosys Finacle is available to anyone who registers on the Efma site. This highly informative annual report includes global insights, recommendations and dozens of financial institution innovation case studies that assist in the understanding of the progress in financial innovation. There is also a recap of all of the questions asked and the results in the research report. There is also a recap infographic illustrating the highlights of the entire report. It can be downloaded here. There were 140 respondents to the online survey, representing more than 70 countries around the world. Overall, 42% of respondents were from high income countries, 37% were from middle income countries and 21% were from low income countries.